Exxaro executive head of coal Dr Nombasa Tsengwa told the 14th Annual Southern African Coal Conference that Exxaro will be spending R20bn over the next five years to expand production capacity by 19.8 million tonnes per annum (Mtpa) from the 2017 production of 47 Mtpa. This involved seven separate projects and the mines involved are Grootgeluk, Thabametsi, Dorsfontein, Mafube, Leeuwpan, Matla and Belfast. “We believe in the future of coal. We think coal will still be in good demand until 2040 when there will be equalisation of renewables and coal,” she said. This positive outlook was based on the fact that some 1 600 new coal-fired power plants are planned or under construction in 62 countries. 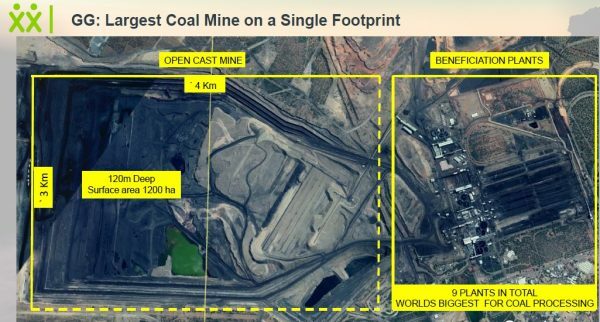 The Grootegeluk mine near Lephalale in the Waterberg coal field is the largest coal mine in the southern hemisphere operated from a single footprint with a production of 27 Mtpa. The opencast mine is 4 km long and 120 m deep, and set on 1 200 ha, with nine plants in total. It supplies the nearby Matimba and Medupi Eskom power plants via conveyors, as well as the domestic and export markets. Exxaro’s plans highlight the positive attitude of mining executives despite the fact that mining production as reported by Statistics South Africa declined by 5.6 per cent year-on-year in November. This meant that production declined by 1.5 per cent year-on-year in the first eleven months of 2018 after a 3.9 per cent gain in 2017. The data does not however include the production from Vedanta’s new zinc mine at Gamsberg, which only started producing zinc concentrate in September 2018. This positive attitude was reinforced by South African Mining Minister Gwede Mantashe who gave the keynote address at the 14th Annual Southern African Coal Conference and who will be attending the 25th Investing in Mining Indaba this coming week. He aims to raise the contribution of mining to the South African economy to 10 per cent within five years from the current 7 per cent and Exxaro’s plans show that this is not just a pipe dream. “For years people have been talking mining down, expecting something nice to replace mining. My view is however that we should talk mining up and my mission is to raise the share of mining to 10 per cent within five years from the current 7 per cent. If you are silent in the face of the negative narrative, then that narrative will predominate,” Mantashe said. He pointed out that mining was the largest contributor to South Africa’s foreign exchange earnings with a 40% share and within mining, the coal sector was the largest revenue generator outweighing the gold and platinum mining sectors. The South African coal industry mines 260 million tons annually of which some 73 million tons is exported and employs more than 86,000 miners who get R25 billion in salaries. Turning to the Fourth Industrial Revolution which is dominating the economic discourse, Mantashe said mining should embrace it. “The Fourth Industrial Revolution is not a threat to mining. Look at your cell phone. It would not exist without mining. In particular coal has been a key driver of the previous three industrial revolutions, but the coal industry is under siege. Mining is not for speculators, but is for long term investors,” he said. Exxaro for one has embraced digitisation and that has helped to control costs as it boosts productivity. Cash costs in recent years have been driven by rising labour, fuel and electricity costs. Richards Bay Coal Terminal (RBCT) CEO Alan Waller said RBCT achieved an annualised throughput of 95 million tonnes in December 2018 when they loaded 105 vessels, even though for the year, RBCT coal exports fell to 73.47 million tonnes (Mt) in 2018 from a record high of 76.47 Mt in 2017. This was due to lower exports to South Korea. Asia took the bulk of the coal exports, with a share of 82 per cent of all exports in 2018, while Europe took 10 per cent and the rest of Africa 8 per cent. RBCT aims to export at least 77 Mt this year. The rail line to RBCT has a current capacity of 81 Mt, while the port has a capacity of 91 Mt. The December 2018 throughput shows that the 2019 target should be achieved. Botswana also wants to get in on the mining boom as it has vast untapped coal resources, but logistics have so far made it uneconomic to bring those resources to account. A mine without logistics is just a hole in the ground. Botswana Minister of Transport and Communications Dorcas Makgato said Botswana has more than 210 billion tons of coal or more than three times those of South Africa, while with a population of just over 2 million, there is little need for coal-based power stations like those in South Africa. Botswana only has one operating colliery which supplies its Morupule power station, but a new coal mine just north of the capital Gaborone will be starting production soon. Minergy will start producing coal in March 2019 with an initial production of some 2 Mtpa, rising to 7 Mtpa once the rail link with South Africa is established. It will initially truck the coal across the border to the Mahikeng rail head for distribution within South Africa to customers such as cement plants.